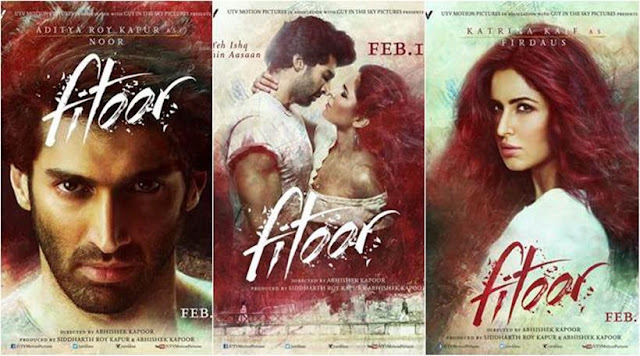 Fitoor means madness, obsession. My Fitoor is my blog, my writing. Due to heavy work load in office I am not able to find time to write regularly. From last three days I haven’t written anything. Trust me I was feeling so guilty about it. There was a feeling of emptiness in me because of not able to write anything. Trust me I am not making this up. I am telling you what genuinely I felt. I am sure lot of you out there who love to write can understand my situation. If you are a finance professional every month becomes busy. Year end is busy, beginning of year is busy, arrr. I was hearing a lot about Fitoor trailer. I wasn’t getting so much time due to my hectic schedule to watch TV or anything. My baby sis was raving about the trailer so much I thought lets watch it finally. Reason why I watched it as I was told that the film is based on Charles Dickens famous novel “Great Expectations”. This is definitely one of the best love stories I have ever read. After watching the trailer I had to find time to review it. So here is my review on the trailer. Review - Whenever movies in India are made on foreign novels filmmakers try to Indianize it for obvious reasons. Lot of times filmmakers are not able to do justice with the original story. Before even watching the trailer I guessed that film will be based in Kashmir. And I was right about it. I feel that can’t these filmmakers chose a different location in India for that. Say Hyderabad or Lucknow or Delhi or Pondicherry. I am not against film being shot in Kashmir but this is just my opinion. If you have read Great Expectations the character Pip is a simple but extraordinary boy. Here our hero is shown with chiseled body. How can that happen? One can get these six packs or eight packs whatever you say after sweating in gym. Here Noor (Aditya Roy Kapur) from a poor family can arrange for chiseled look. Second Katrina is looking so fake in the movie. She is not just looking perfect for the role. Third Tabu is the only best thing to look forward to. Her acting skills could uplift the film. Then above all there is Kashmir riots/disputes. And that dialogue in the end of “Kashmir mangoge to cheer denge” jeez what have they done? I am sure if Charles Dickens would be watching the film from heaven he will feel like committing suicide. This film might work in India because lot of those people who haven’t read the novel. Like my sister she loved the trailer. And other section who like Great Expectations novel are not gonna like it.